14th Annual Widmer Brothers Brewing Oktoberfest on Saturday, September 29th from 12pm-11pm. Free family activities from 12pm-4pm brought to you by COUNTRY Financial. Must have paid admission from 4pm-11pm. 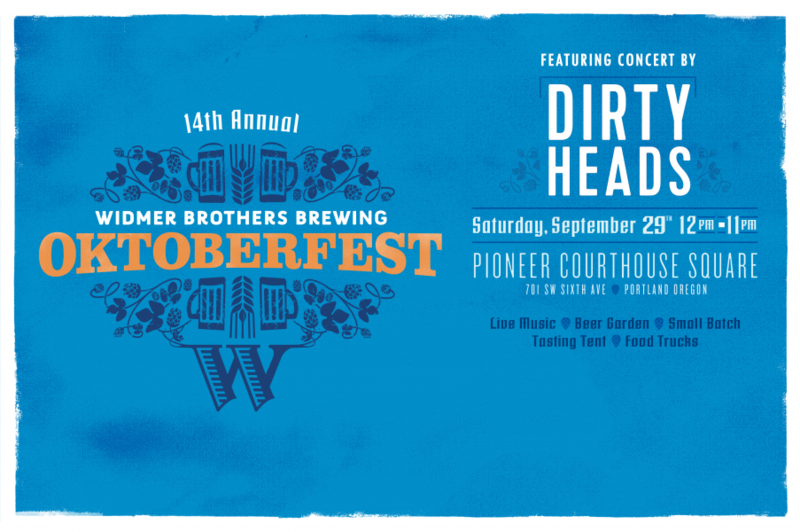 Live music from Dirty Heads scheduled at 8:30pm. Steins available to purchase from 12-3:30pm. All paid admissions come with a stein. Portland’s longest running Oktoberfest is bigger than ever at Pioneer Courthouse Square on September 29th: it's Widmer Brothers Brewing's 14th Annual Oktoberfest! It’s a beer lover’s paradise with all of your favorite Widmer brews, plus specialty small-batch brews you can only sample at Oktoberfest! This year's event includes a live performance by Dirty Heads, best known for their hit “Lay Me Down” as well as local entertainment including: an appearance from Rojo the llama and Napolean the alpaca from Classy Camelids, palm and tarot card readings from Portlandia Fortune Tellers, free themed face painting, an exciting performance from Those Darn Accordions, plus food, music, and more brought to you in part by COUNTRY Financial! Be sure to check out our Facebook Event Page for more details!